This weekend, scores of players in Busan, South Korea, will compete in a LAN pulled from Ready, Player One’s wildest dreams. Stacked up in double-decker computer hubs, 100 competitors at a time will drop onto the abandoned island of PlayerUnknown’s Battlegrounds and scrap, shoot, and crawl until only one person is left standing at the center of the blue circle. PlayerUnknown’s Battlegrounds has been a breakout game this year, and its esports potential has been noted time and again. Organizations like TSM and Cloud9 have already started to swoop in to pick up teams, and competitions are forming the start of a real circuit. Between solo events, charity tournaments, and organized team competitions with brackets and jerseys, there’s a wealth of different ways PUBG is being played. Despite being an Early Access game, it seems both players and spectators are eager to watch high-quality PUBG. But what should competitive PUBG look like? With no guiding hand from on-high or even a designated “competitive” mode in-game, tournaments have been left to their own devices. 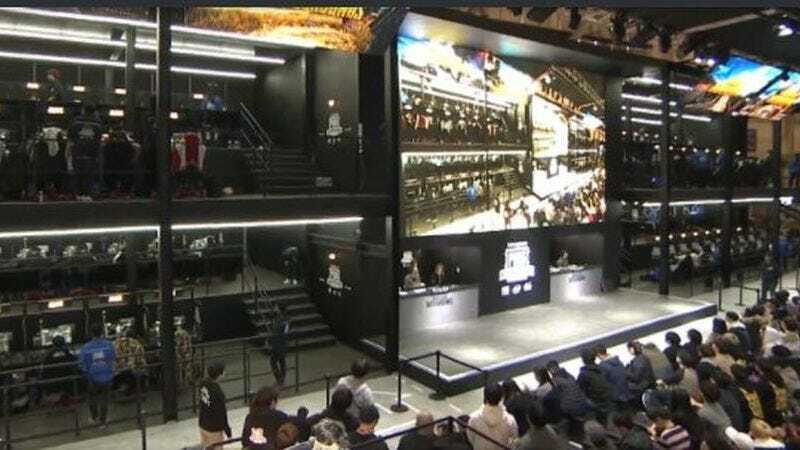 Across multiple events, there have been several different iterations of what PUBG and other battle royale games could look like in a public LAN space. PUBG shines when it takes the spectacle above and beyond the cut-and-paste esports setup, when the actual stage reflects the volume of chaos in the game itself. Besides Busan, other tournaments have experimented with the 100-player LAN setup. At Gamescom, the PUBG invitational hosted all the players in mock ruins, with numbers and dividers separating the play areas. It was a unique look, very different from the two-booth esports setup that has become dominant in most competitions. As competitions have scaled up and become more prevalent, the “esports tournament” look has become very straightforward. Most events feature sleek player booths, one on each side of the stage, with a screen separating them. It works for most, but it’s also very similar. The scale and spectacle is a little less every time. Most try to amp this up with unique stage gimmicks, thematic cosplay or even a dragon, but at some point, two teams will sit down in their booths and start playing. At Gamescom and Busan, this PUBG competition isn’t just one side versus another, but 100 players dropped into the same arena and told that only one will win. Looking at the set instantly gives viewers a sense of the scale of the competition, the chaos that can culminate from so many hungry fighters left to fend for themselves on an island filled with high-powered weaponry. The nature of the game, especially in solo play, requires players to be physically separated from each other but still in the same arena, and this creates the potential for new formats to develop. Architecturally, PUBG can be a different construct entirely, building double-decker LAN hubs and massive setups with 100 computers. A panopticon of PUBG just has a nice ring to it, and it allows production to get creative as well. Maybe each player’s booth could be lit up, and when they fall in game, their station goes dark. As players fall one-by-one, the stage could dim darker and darker, until only a few blips of light remain, isolated, with every movement visible to the audience. This sort of setup could naturally convey the growing tension of a real match of PUBG for the audience. The PUBG setup at Gamescom, which featured nifty dividers and individual setups amid faux ruins. In films like Battle Royale and its Western counterpart, The Hunger Games, there are certainly elements of strategy and tactics. But there’s also an inherent mayhem and randomness that comes from individuals all vying for their own survival. PUBG is a competition of skill, but it blurs the line between sport and reality competition. It’s one step removed from having a gaudy host announcing the next batch of tributes, and that’s refreshing for someone like me, who spends most waking hours watching hours of esports with variations on the same theme. If Steam metrics, LAN cafe numbers, and Twitch viewers are anything to go by, PUBG will be here to stay for a while. As competitive PUBG continues to grow, it has a chance to capture another audience entirely: esports fans who are looking for a fresh take, a competition that’s new and exciting. Whether teams or solo, showing the corporeal scale of a competitive PUBG match isn’t just a quaint spectacle, it’s a new frontier for tournaments. As PUBG grows in prominence, I hope tournaments continue coming up with even grander ways to host the chaos.